The day that Vermell, age 41, had to move into a shelter, she thought the moment was the lowest point in her life. As a single mother of 7 children ranging in age from 6 to 21 years, Vermell had already had to overcome enormous obstacles in her life. 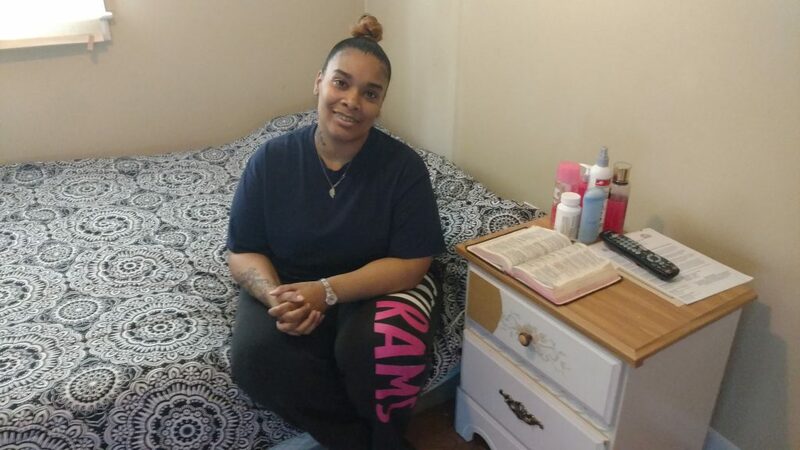 From being born to an addicted 14-year-old mother to nearly being sold to a man at the age of 14, to escaping to live with an addicted great grandmother, to dropping out of high school to sell weed to pay for clothing and shoes for herself and two younger sisters, Vermell lived the absolute definition of a rough life. She had every excuse in the world to quit trying and determine that the world was against her. Despite her situation, Vermell was fortunate that her great grandmother, who she refers to as “Grandma” showed her kindness even when her mother and grandmother did not. “She loved me and she taught me about church.” Her ‘grandma’ owned a 4-bedroom home, which she often opened up to multiple families at a time. Her hospitality for anyone in need left an impression on Vermell and has stayed with her to this day. Vermell moved in with a man in a rough part of Chicago. He made his living as a dealer, and so did she… right until she found out she was pregnant. Her pregnancy changed the course of her life dramatically. Vermell stopped drinking and smoking weed for the health of the little baby that was growing inside of her. Although a drug culture surrounded her she stopped dealing and tried to steer clear. Vermell delivered a healthy baby girl. Her baby girl was soon followed by 4 more children. Vermell longed for a better life for her children, but the reality of making that happen was a long shot. The father of her children did not choose a path of improving his life for the good of their children. He continued to make a dangerous living dealing drugs. The family moved to a suburb to escape the violent neighborhood after a relative and his best friend were gunned down in a car just outside their home while Vermell and the kids were inside. Vermell was delighted to be away from the gangs and drugs, but the father struggled with changing his lifestyle and continued to travel back to Chicago to ‘hang out with’ his old crew. Fate caught up to him when he was shot over a gang-related territory dispute. His best friend was murdered at close range, and he narrowly survived with 3 gunshot wounds because he saw the shooter pull the gun and ran. He will live with a bullet lodged in his chest for the rest of his life. Although he survived the shooting he was facing prison time. The shooting was the tipping point for Vermell, who packed up her 5 children and the very little that they had and moved yet again (without the father) since the shooters were likely to know where they had been staying and could come back to finish off the job. Life was alright for about 5 years. Vermell worked hard to pay her rent and necessary bills. She worked even harder at parenting her children to work hard and be respectful. She even temporarily took in two children of a deceased relative who were to be placed in foster care. She met a new man who was kinder and supportive of her and her children. The two of them got engaged and imagined a better life together. Vermell tried on dresses and loved her beautiful engagement ring. This man encouraged one of Vermell’s daughters who was musically gifted to pursue a career and helped to arrange and finance a handful of music videos. The couple had two children together. When asked about this period of her life, she says “I was taking life for granted.” She never expected what was coming next. Vermell’s landlord was elderly and passed away. The landlord’s family acquired the property, and not wanting to be in the rental business, they sold the home. Vermell and her 6 children were given 3 weeks notice to clear out. Her oldest daughter was no longer living with her as she had moved to Madison to attend school. Although frustrated at the eviction Vermell wasn’t panicked. She had been paying rent and utilities for 5 years so she should be able to find another affordable place. Her poor credit from her past prevented her from being considered by other landlords. Suddenly homeless, Vermell tried hard to find temporary homes for her children. Her 20-year-old daughter got a job and moved to an apartment. 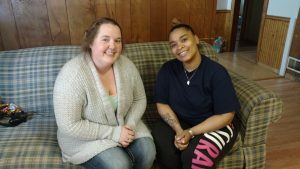 Her 17-year-old daughter moved in with a relative so she could finish high school without having to move to a new school. Vermell asked her ex, now out of prison and the drug industry and married, if he would temporarily take his two boys (ages 13 and 15) since he was living in a 3 bedroom house. He refused as his new wife didn’t want the bother. Without any other options, Vermell moved the large family into a hotel in Madison near her oldest daughter. Her oldest could help her with child care while she searched for a job and housing. The hotel stay lasted 1 month until she was nearly out of money. Still not having found the job and apartment needed, she moved to a less expensive hotel in Naperville in hopes of finding something there. She even pawned her beloved engagement ring. Then the money ran out. One of Vermell’s younger sisters had been living in Ottawa for the past couple of years. Her sister had a 2-bedroom home that she shared with her 3 children. Although it would be a tight squeeze, she offered Vermell and her family a temporary home with her. Vermell was grateful, but this wouldn’t be sustainable with so many people packed into one small house. Furthermore, her sister battled some of her own obstacles and after offering to house Vermell’s family for free she changed her mind and required rent. Every part of Vermell desired a safe place for her family, but she was out of options. She got to work. She enrolled her school aged children in school in Ottawa. She applied for a Link card. She applied for Section 8 housing. And then she took the final terrifying step of touring the Ottawa PADS Shelter while her kids were at school. She believed that this day, despite all of the other difficult days in her life, was the worst moment so far. She explained that she had mentally prepared herself, but she hadn’t even mentioned to her children that she was considering a shelter. She silently prayed that her children wouldn’t look at her as a failure or a loser. The family split up for about a month. Her two teenage boys remained at her sister’s house since all of the family rooms were occupied at the shelter. Vermell slept in the women’s section with her youngest son and daughter. It was crowded and it was often loud with over 60 people and up to 25 children living in one building. It was difficult to get her children to sleep at night to be prepared for school the next day. But Vermell and her children were safe, well fed, and most importantly, they were showed the love of the community. The very moment a family room became available Vermell moved her sons out of her sister’s home and into the shelter to be with her. She was so eager to move into the family room that she offered to help the other family move out their bags. In the family room, it was much easier for Vermell to work with the children on their homework, to enforce a proper bedtime, and to emotionally support her children. While at Ottawa PADS Vermell took the money management courses and involved herself in Bible study. Staff also helped her secure an identification card and provided her and her children with needed clothing. With her family together and with the encouragement of the staff, Vermell found renewed hope. Still she had setbacks. She was offered public housing in Mendota and told she could move in by Thanksgiving. There was a mix-up and there was one person ahead of her in the queue, who ended up accepting the home. Her poor credit was still making finding housing difficult. Her fiancée experienced some setbacks in his life with his business and family relationships, making it impossible for him to move near her. Still, Vermell pushed forward to provide for her children. Very shortly before Christmas, Vermell received her Christmas miracle. She won the lottery! It wasn’t the state lottery, but it was the lottery for Section 8 housing. “I was crying and I couldn’t believe it,” describes Vermell of the moment she was notified. The way Section 8 works is that it will pay the rent if you can find an approved landlord. She was given a long list and began her phone calls right away. Even that was proved challenging. She finally spoke to a landlord who agreed to give her a try. She worked through Tri-County Opportunities Council to get a security deposit. 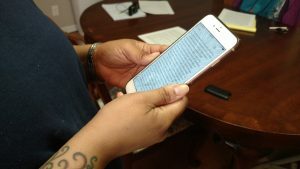 She would have to find a way to make the full payments for utilities, and her fiancée stepped up to the plate to help out. She also attempted to begin receiving child support from the father of her older children (she had never received a dime in child support previously – he had convinced her that this would be too difficult for him). At this point she has still not received child support, and the father, in turn, has hired an attorney to attempt to gain custody of the kids, likely so he can claim them on his taxes. She has to fight this battle in court later this month. Nonetheless, Vermell and her children moved into their new apartment on December 20th. Her oldest daughters purchased a Christmas tree, and they celebrated Christmas as a family in their own space. Later that week, Lily Pads Resale Boutique provided donated furniture and other household supplies to help furnish the bare apartment. So where does Vermell go from here? She needs to go to court later this month to prove that she is a capable mother and deserves to maintain custody of her children. She is waiting on her income tax return with which she hopes to purchase a used vehicle which would help her with employment. She stopped smoking on January 1st and is trying to remain smoke free. She hopes to begin a dental hygienist program at a community college. She hopes to marry her fiancée and eventually rent to own their own home. Vermell has begun to write her story on her phone. She has begun to write down some of her experiences and hopes to turn it into a book someday. She vows that she will not complete her book until she owns a home. She hopes that she might be used to inspire others going through a difficult situation that they can overcome their challenges if they work hard and remain hopeful. One day she hopes to be in a position to volunteer at Ottawa PADS to give back to the community who gave to her. When asked about her children she explains “I love my kids to death. I would give them my heart or my last breath.” How have her children fared during the wake of temporary homelessness? Her 22-year-old daughter still attends college in Madison where she is studying to become a physician’s assistant. She works as the manager of McDonald’s to support her schooling and rent. Her 21-year-old daughter works at a call center in customer service. She plans to enroll in community college next year. She is a talented musician and rapper. One of her videos on YouTube has over 6 million views. 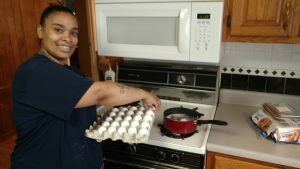 Her 17-year-old daughter is soon to graduate high school and is considering working for one year to save money before enrolling in college. Her 15-year-old son is attending high school where he played on the basketball team this year and is currently running track. He says he wants to become a police officer. Her 13-year-old son is in 8th grade, on the honor roll, and will play youth football this summer. Her 9-year-old daughter is nearing the end of 4th grade. She had struggled with her grades while transitioning from school to school, but is back on track. She is in love with music and dancing. Her 7-year-old son is finishing 1st grade. He is reading at an advanced level and the school is considering having him skip 2nd grade. He also loves music. The deep love of a mother can be a powerful force. Vermell’s goal as a mother is to break the family cycle of neglect and addiction. Her goal for her children is to raise them to be responsible, respectful, and independent. Her goal for herself is to go from ‘nothing to something.’ We hope that’s what she will title her book. Vermell now shares a bedroom with her youngest son. She keeps a Bible next to their bed.